"The Dude buys a stopwatch." The title comes from Bill Bowerman's book called "Jogging" in the section on how to jog. The idea of jogging isn't the first to immediately come to mind when you bring William J. Bowerman, co-founder of Nike, coach of Pre, into mind. Usually, it's the magnificent runners charging across the Eugene landscape, or powering through the final lap at Hayward that catch our imagination, not a very pedestrian jogger out on the road. Yet, more than any one individual, except perhaps Dr. Kenneth Cooper, did more to set the spark to the original running boom in the United States. He did so after his well-publicized visit to New Zealand and meeting with Arthur Lydiard. Embarrassed by his own lack of fitness, he returned to the States an acolyte for running for everyone instead just the elite masses. That's it. For timing, he suggested a wristwatch or pocket watch. Nothing was so exact with a jogging program that a few seconds of sloppiness in the timing department would ruin things. You can almost hear the derision in Bowerman's voice when he writes, "The dude buys a stop watch." For those of you under, well my age, dude hasn't always been a greeting you toss at your friends. It used to be a term more synonymous with a dandy or a pretender. Bowerman also reserved some pointed remarks for the sports culture in the country. Again, remember that it was 1967. Things have not improved. He makes the interesting point that most ordinary people have been discriminated against in the field of sports. The best coaching, equipment, and venues are reserved for two groups: professional athletes, and youngsters. Before you scoff, go to a big city and try to access the school track outside of school hours. There's an excellent chance that the gates are locked and, if you're caught on 'their' track, you'll be warned against trespassing. Grossmont Community College in San Diego comes immediately to mind. Bowerman favored the creation of running clubs but I'm not sure what he would have thought of our current crop. I suspect he'd be a bit dismayed. One of the admonitions in the back of the book as he talks of forming clubs, both formal and informal, was this: "Watch out for the "professional," who urges you "ever upward." This type of instructor regards you as something akin to un-American if you don't strive all the time. 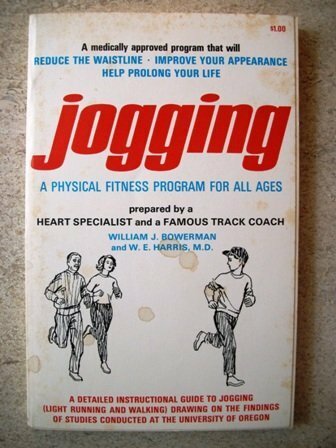 That's not what jogging is about." Something to think about the next time you head for the track and I'll throw in another question as a bonus.